Manall Kayiru 2 directed by Madhan Kumar features S Ve Shekher, Visu, Ashwin Shekher, Poorna and others. Dharan Kumar has composed the music for the film and recently Anirudh had rendered a number for this comic sequel. Sharing the information to behindwoods, Dharan says, “There are three songs in the film and one promo number. There is one melody that is sung by Shakthishree Gopalan; there is an intro number sung by Ashwin Shekher and Suchitra and a promo song sung by Mukesh and Manasi. Anirudh had sung a typical commercial kuthu peppy kind of a number. We wanted Anirudh to sing this number as we all felt his voice would be apt. It is a solo track and when asked, he was much obliging. It was a nice friendly recording. 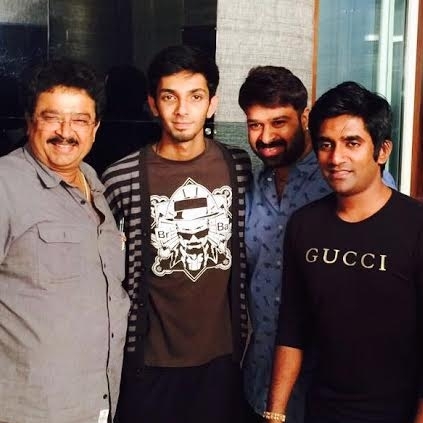 Anirudh had given his special touches to the song and has enhanced the feel. The lines will go like 'marriage naalae made in heaven illa da'. We have shot the song already with my voice in the track. But when he sang, his voice added so much value to it. Even though we had already shot the song, when we synced Anirudh’s voice with the visuals, the effect was different and nice. He also gave a few ideas which we incorporated”. Dharan is also involved in music composition for films like Thollai Kaatchi, Devadoss Brothers and Maalai Neram. People looking for online information on Manall Kayiru 2 will find this news story useful.